Watch Video: Yo Yo Honey Singh's Comeback Song Makhna, Trailer Out Now! Home BOLLYWOOD Watch Video: Yo Yo Honey Singh’s Comeback Song Makhna, Trailer Out Now! Watch Video: Yo Yo Honey Singh’s Comeback Song Makhna, Trailer Out Now! After giving superhit year with multiple hits now Yo Yo Honey Singh is all set to make a comeback with his all-new single ‘Makhna’, the trailer of ‘Makhna’ is out now on the YouTube channel of T-series. 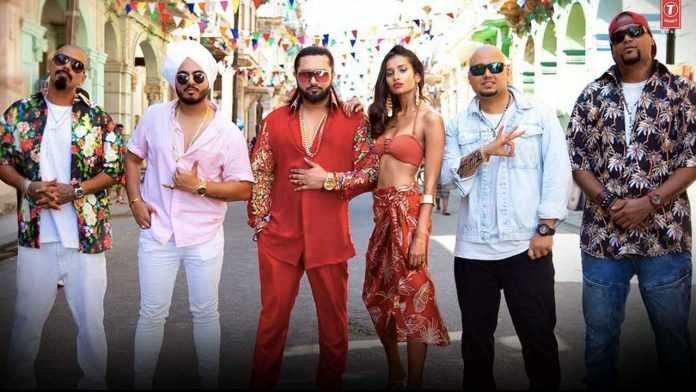 ‘Makhna’ makes 2018 more special for Yo Yo Honey Singh as it will be his comeback after a very long time. ‘Makhna’ teaser looks very interesting and intriguing as it has shown the diamond robbery while it looks like Yo Yo Honey Singh is playing the role of Mafia. The song is a romantic number which is composed by Singhsta who’s the vocalist of R&B group. The entire song is sung by Yo Yo Honey Singh and the female part is sung by Neha Kakkar. The song also features three top rappers, Phenon the Don, Alistair, and Sean. The video also features top model Nidhi Sunil opposite Yo Yo Honey Singh raises the temperature. Yo Yo Honey Singh’s ‘Makhna’ is going to be out soon on 21st December to make your Christmas more special. Next articleHere’s What Sohum Shah Has To Say About His Upcoming Next!